Peelable hot melt glue for use with standard size glue guns. 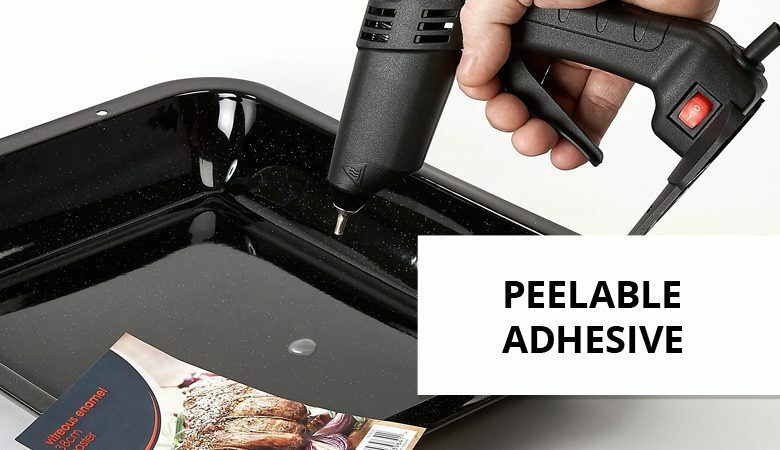 Peelable glues are often pressure sensitive, so it’s very difficult to run this kind of adhesive through a glue gun without it swelling and blocking the glue chamber. But each peeltec 210 glue stick is specially formulated to avoid this – so when pressure is applied to feed the stick through the glue gun, it runs through with no problems. Peeltec 210 can be used with conventional 12mm (½″) glue guns, rather than specialist tools. Which means you can now get even more mileage out of your 12mm (½″) glue gun. A peelable – or fugitive – glue, peeltec 210 can be removed easily once cool without any residual tack or residue. When applied sparingly it won’t damage either surface, making it ideal for creating temporary bonds. It can be used on many different materials, including plastics and a range of paper types and board – with various print finishes and varnishes. For best results, we recommend using the glue on a test area first. Some competitor’s glues can only be run through specialist tools which are thumb fed, but peeltec 210 can be used in a tec 305-12 glue gun. This ensures improved comfort for the operator, and could even lead to increased productivity. It could also result in a hefty saving, as tec 305 glue guns are economically priced and offer great value.